LHS-VHHS fencers dominated at the 2016 JV Championships this weekend winning medals in every event and bringing home three gold medals, three bronze medals and two 8th place medals. LHS-VHHS won more gold medals than any other school in the Great Lakes High School Fencing Conference. Remy Price, from LHS won the JV Championship with a gold medal in Men’s Epee. Forrest Cotterman, from LHS, won the Bronze medal in Men’s Epee. 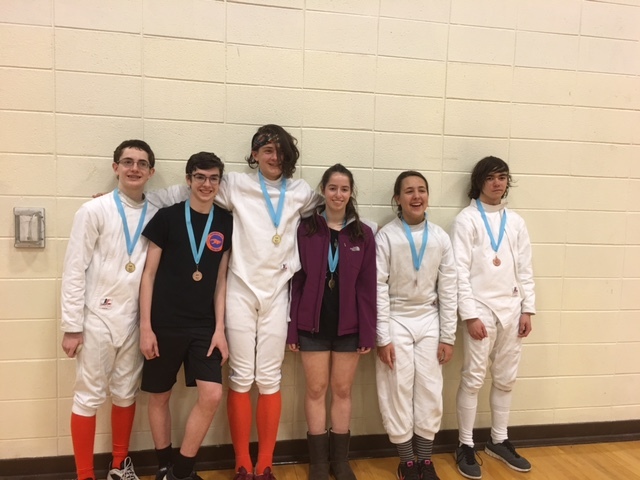 LHS’s Dylan Boyle, won the JV Championship in Men’s Saber, while Lia Pelech, from VHHS, won the JV Championship in Women’s saber and Jessica Nudelman, also from VHHS, won the bronze medal in Women’s Epee. Also winning medals were Marty Brannaman from LHS who won the 8th place medal in Men’s Foil and Jack Liang, from LHS, who won an 8th place medal in Men’s Saber.